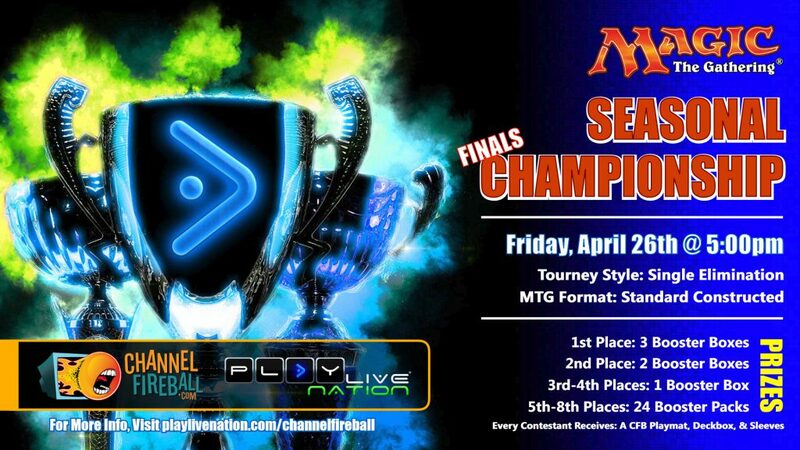 Join us at participating PLAYlive Nation locations for our Seasonal Magic The Gathering Championship Series. Contestants will compete against other MTG players face-to-face in qualifying rounds throughout the month of April. Players battle for wins as they generate points based on how they perform in their game. The top 8 contestants will then go on to compete in the Finals on April 26th. Prizes will be given to the finalists based on their final rank. The time and availability of each event during the week can vary per location. Check with your local store's events calendar to confirm dates and times. Qualifier Events are always organized around 3 rounds of Swiss-Style tournament play. Finals will be conducted in Single-Elimination / Standard Constructed style play. The 8 players who have accumulated the highest amount of points from the qualifiers will be invited to compete in your local store's Season Championship. During all events, stores will also be giving away other cool swag and prizes to contestants! Important: The graphics below are examples. Your local PLAYlive Nation store will have a specific set of dates and times during the week for these events. Check with your local store to confirm dates and times. Not all stores will be participating in this event. You can find out whether or not your local PLAYlive is participating by checking the list above.